Sequin is a trend I first noticed in fall 2009. It slowing has been creeping into plus size fashions. Sequin does not seem to be going away, either. I thought cool sparkle for fall and evening looks. Now it's spring 2010 and I am still seeing sequin looks all over the place. You can deck your self out in sequin from full on leggings, skirts and dresses or just a touch of sparkle with sequin applique top or accessory such as belt. Sequin can add a touch of shine to any outfit. Just depends if you want sparkle a little bit or be blinding and make everyone notice you. I have my own sequin items I recently got, all with just a touch of sequin. Enough to say hi look at me, don't I look cute in my sequin! How many of you are going to shine in spring with your sequin? If you haven't yet jumped on the sparkle train, have my gorgeous friends convinced you to add some sequin to your wardrobe? 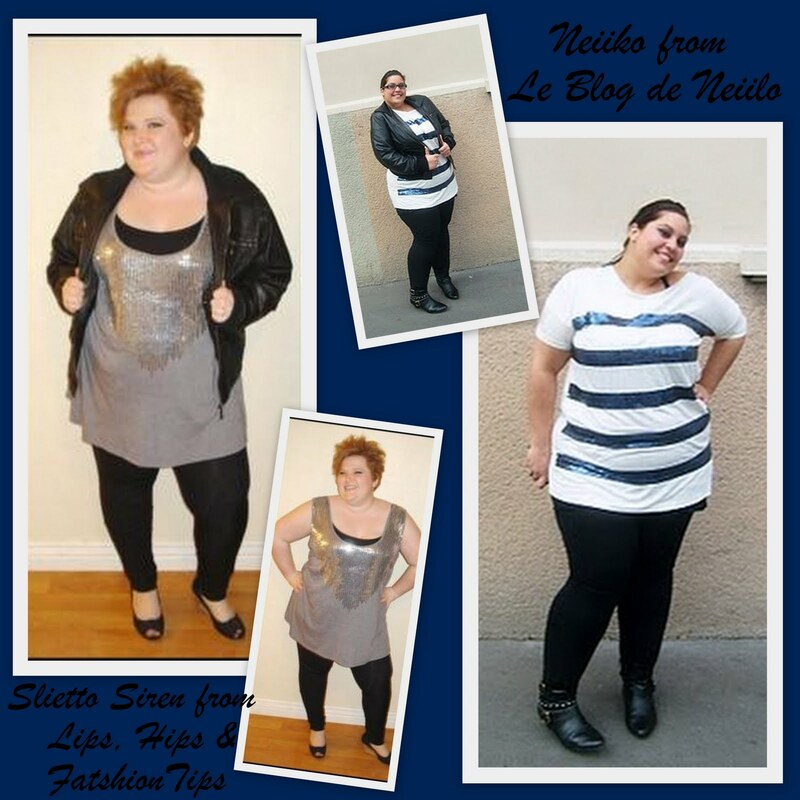 Stiletto Siren from Lips, Hips & Fatshion Tips is wearing a sequin tank from Target. She wanted to shine on Saturday night while hanging out with her friends. Neiiko from Le Blog de Neiiko is wearing sequin stripe tunic from H&M. She looks so cute & happy, it must be the sparkle in her outfit! 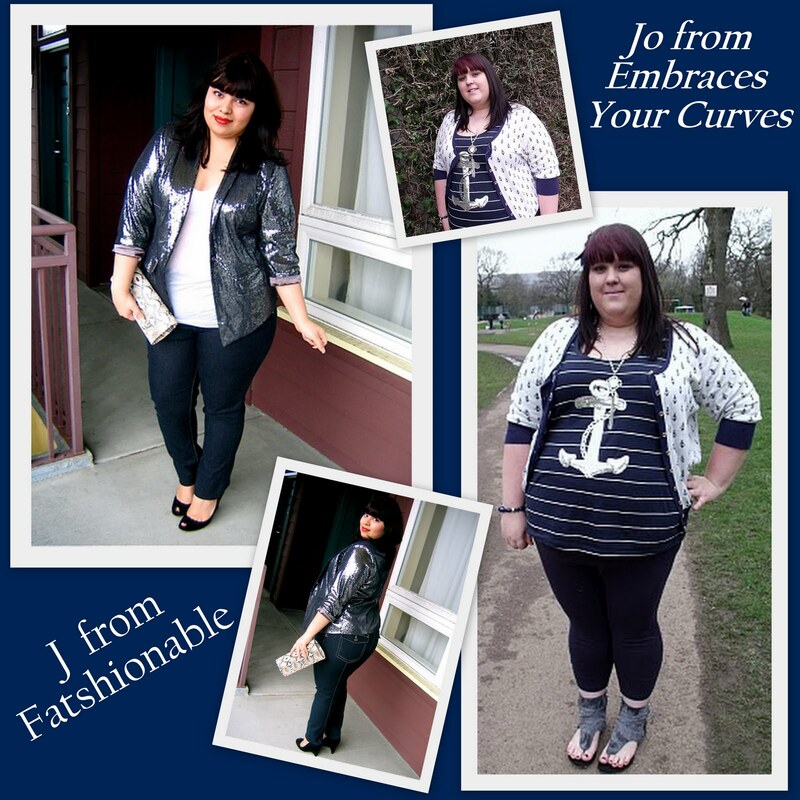 J from Fatshionable is wearing sequin blazer from City Chic. J is always rockin the latest trends, she sizzles in her sparkle. Jo from Embrace Your Curves is wearing sequin anchor top from Asos Curve. Just a touch of sparkle is perfect for her nautical spring look! Thank you for including me in this post! I love a little bit of sparkle in any look! I love these posts- everyone looks fab! kind of off topic but I Love Jo's shoes! I cant beleive im side by side with j! wish that was real life lol ! I like this post, thank you for added to your sparkle selection! those clothes are so cute, but I've never seen sequin belt, and that's just perfect! great post! !nice blog HONEY! :D I LIKE IT!! !